Istanbul is twice the size of New York city and is remarkably free of crime – safer, perhaps, than most major American cities. If you’ve never been to a Middle Eastern metropolis, this may be the one to visit first. Hopefully, your first glimpse will be the skyline at dusk, and you may never forget it. Slender, illuminated minarets pierce the sky, and the domes of the Hagia Sophia, once Christianity’s most revered site, shimmer in the glow of the city’s lights. Yes, the streets wind and twist and sometimes the din of traffic is maddening, but there’s little or no rudeness, very few belligerent voices and enough English spoken to make the city’s cafés, fruit peddlers and savory restaurants accessible and fun. The Tourist Police go out of their way to accommodate travelers, and taxi drivers are unfailingly proud of their city and very eager to please. What makes Istanbul unique is the mix of styles. The stalls and shops of the huge Grand Bazaar and Egyptian Market are exciting kaleidoscopes of colors. Beautiful hand-woven carpets, bags of spices, song birds, inlaid furniture, mounds of multi-colored Turkish sweets, gold and silver wares and jewelry are laid out for sale in the jostling but never threatening market. But there’s also a strong sense of the “West” or Europe in the dress and discos and general ambiance. Mobile phones, for example, are of course ubiquitous. Faxes go through as easily as they do in the States, and clean, public toilets are more readily available than in most U.S. cities. The museums, especially the Turkish and Islamic Arts Museum, are oases usually set in palaces or exquisite homes from the Ottoman Empire. 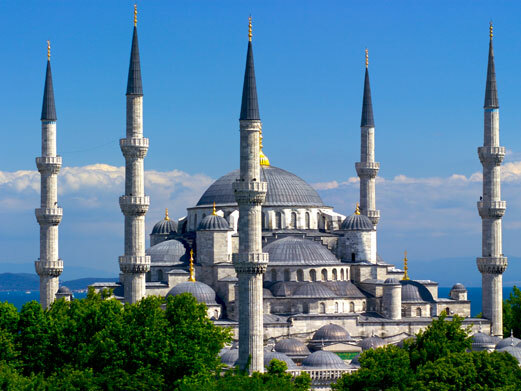 Remarkably, the Blue Mosque (named for the lovely, cool blue tiles that ring the light and airy interior) with its six slender minarets wasn’t harmed in the various earthquake. Neither was the Hagia Sophia, a Byzantine architectural wonder that became a mosque after the Ottoman conquest. Today, it’s a museum, and very impressive. Some say it rivals St. Peter’s Basilica in Rome. The call to prayer drifts over the city five times a day because Turkey is an Islamic country. But unlike many Muslim countries, it’s a successful blend of religion, democracy and secularism co-existing, if not always easily, always hopefully. Four days in Istanbul will give you a real sense of this city astride the Bosphorus. • The Topkapi Palace, the greatest Ottoman museum in the world was the nerve center of the empires’s administrative, miliary, educational and domestic activity. The place sprawls as befits the locus of a nearly four hundred year empire. Lots of palace intrigues here. You’ll see the Harem which was supervised by Black Eunuchs. The women of the harem were typically slaves and prisioners of war selected for their beauty, charm and spirit, and educated within the walls. There are the dazzling jewels of the Sultans including the Spoonmaker’s diamond (86 carats) and a seven pound emerald. Various courts, chambers and audience halls surround a graceful courtyard where royalty met and greeted the envoys from the far-flung kingdom. Some of the holiest artifacts in the Muslim world are in Topkapi reminding the visitor that the Ottoman Sultanate or empire was spiritual as well as brilliantly administrative and military. • The Blue Mosque (also located in the Sultanahmet section of Istanbul, the must-see center of the city’s history and culture) or Sultan Ahmet Cami is the most striking monument in the city. Recognized by its six minarets, the interior is light, airy and serene, and women are welcome. The stone work is beautiful, and the blue tiles lead the eye upward to a dome of exquisite workmanship. • A short walk leads to the Hagia Sophia (Divine Wisdom) whose series of domes and buttresses dominate the skyline. An architectural wonder, the Byzantine cathedral was commissioned by the Emperor Justinian and dedicated in 537, and remained an inspiration to Christians around the world. In 1453 the city and the cathedral fell to the Ottomans who, while ill at easse with the icons, respected (more so than the marauding Crusader knights earlier) the building and turned it into a mosque. It was later turned into a museum by Kemal Ataturk in 1935 and easily rivals St. Peter’s basilica in Rome with its masive vaults and towering columns. • A visit to the Suleymaniye Mosque (after Suleyman the Magnificent) and the well-lighted and beautiful Turkish and Islamic Arts Museum are musts. The museum is a real find. Set in the Palace of Ibrahim Pasha – across from the Blue Mosque – the museum chronicles the best of Islamic design and art in a lovely garden setting. After all the sight-seeing and food-sampling, take a cruise along the Bosphorus. Ferries run regularly (and cost a few bucks or so) and are a delightful way to cool off and see the elegant homes and old palaces that line the river.